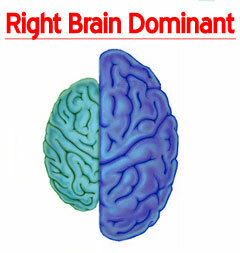 Your answers suggest that you are more Right Brain dominant. You are more visual, intuitive, and rely on your feelings. You tend to look at the whole picture first, then the details. Right brain thinkers can see the whole of a problem first before the details and view problems from different perspectives. They are creative, imaginative, and particularly good at solving open ended problems. People that are right brain dominant however, can suffer from too many approaches and can be scatterbrained. They also tend to be less organized, lack attention to detail, and have trouble explaining their ideas verbally.